You grew up in India, what was it like coming to New York for the first time? I came to New York in 2007 for my college and that was my first time ever in the United States. I didn’t know anyone here, didn’t have any family or friends, just arrived at JFK with 2 large bags and the address of my college dorms (FIT). It was definitely a big transition in life but I was excited. Maybe since I went to a boarding school back in India (which is considered a good thing), I was confident to get my way around, but deep inside I was still nervous since everything was completely new to me. I remember that moment very well when I sighted the skyline of New York City on my way from the airport. I think that’s when it really hit me that I am actually here, the grand New York City I grew up watching in the movies, and I realized I was very far from home. That’s when this voyage begins and along the way I was fortunate to have met people from all around the world with similar stories, and that only helped encouraging me to get going and make a place for myself here. How did your family influence your interest in the fashion industry? My family had a big impact on why I ended up in fashion. I came to New York at first because my brother (who was here for an internship with American Eagle before I arrived) introduced me to FIT and recommended me to apply there. Also my father has a textile business so my childhood was all about hearing cotton, silk, polyester and playing hide & seek in his fabric warehouse. So in a way I grew up with that familiarity to fashion industry and all my professional paths kind of kept opening themselves in that same direction. How did your study abroad year in Italy influence your perspective on the fashion industry? That 1-year of studying in Italy exposed me to a different form of entrepreneurship in Fashion. Our program included visits to fashion houses, suppliers and events like trade shows and fashion week, where we met with the business executives and learn more about their approach. I felt the entrepreneurs there were very expressive about their ideas and were not hesitant to incorporate their personal touch into their products. Fashion there, I felt, was very personal and all about self-expression. And the consumer too tends to connect more with the ideas of the artists first and then builds a loyalty towards their approach. Maybe that’s why the luxury fashion is still dominated by Europe. But anyhow that experience helped me to see fashion designers as artists and appreciate their ability and the courage to reflect their ideas into their work. Tell us about Techpacker: What is the philosophy and how does it empower designers? Techpacker is the world’s first fashion life cycle management tool (PLM) that is designed for growing fashion designers and brands. Our philosophy is to build accessible and affordable design management solutions so that any designer can get quality products made from any part of the world easily. Unfortunately such technologies are still only available for larger fashion companies who can afford to use them to optimize their supply chains. But now individual brands and designers are also starting to venture out their operations and scaling both on a local and global level. We want them to also leverage on PLM technologies that are affordable, easy to use and give them full control of their supply chain and optimize their businesses. In the 14 months since the launch Techpacker already has 4500 users. This indicates that you are onto something important. Tell us more about how Techpacker is more accommodating to the needs of the designers than classic PDM programs? Fashion designers are creative people; they are artists who are always willing to adapt new methods or technologies into their work process as long as they are inspiring and comfortable to use. And that is what the classic PDM programs have failed to deliver. They are not easy to use, their interface is too serious and most of all they aren’t even affordable for any small individual brand. This is why these small companies ended up picking Excel and Illustrator for their design management purposes and molded them as per their own needs. But as business grows, managing information on these softwares also becomes a challenge. For the first time designers are now finding that ease and approachability in Techpacker to handle all these obstacles. When they realize that it’s a web based app that lets them view and organize their style developments, helps them create professional tech packs and all in a fractions of a conventional PDM price, it simply gets them to jump right on it. This is perhaps one-big reason why so many designers have joined us in such little time as we are actually solving a big problem that has not been addressed before. 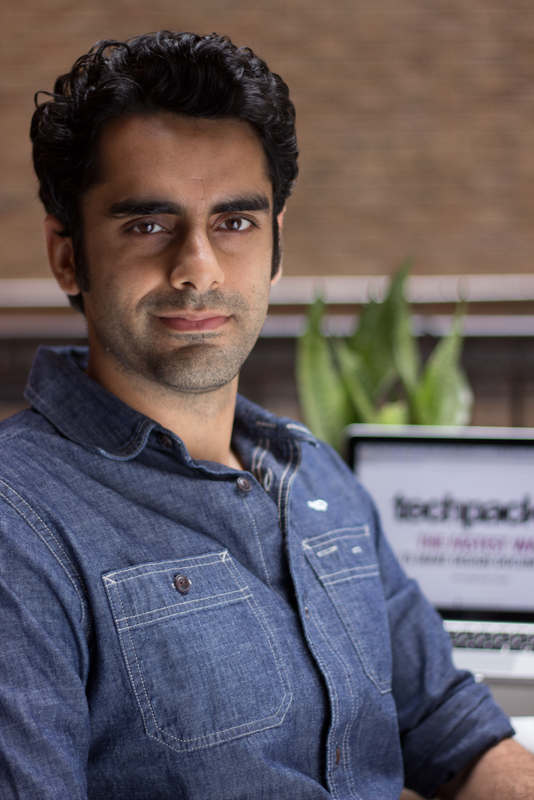 Tell us a little about the other 2 founders of Techpacker: My brother, Saral Kochar is the CEO of the company and holding the command from our Hong Kong office. His intelligence and vast experience in product development and production with companies like Li & Fung and American Eagle Outfitters brought us the major breakthrough to make Techpacker a visual and streamlined communication platform. Apart from that he lives on a boat, walks to work, meditates and enjoys hiking. He graduated from London College of Fashion with Product Design Development degree. Josie Tam is CTO of our company and is also based out of our Hong Kong office. She is a 3' 11" of dynamite that makes sure everything on Techpacker.com runs smoothly. She enjoys organizing events and fixing bugs (Amazing!!). She has a masters in IT Management from the Chinese University of Hong Kong and has more than 10 years experience with senior project executive and Business Process Improvement positions at TAL Apparel limited, Maersk etc. a) Our Backgrounds: I went to FIT to study fashion merchandising and post graduating stayed in the city and worked in buying for a few fashion brands. Our CEO, Saral also worked in New York for a brief period until he found a great fashion production related opportunities in HK and has been living there since. He met our CTO, Josie there who’s a HK national and is also coming from the technology solutions area for fashion ERP systems. b) Strategically Divided: It made total sense for us to capitalize on our geographical divide. As New York is the fashion capital of the world with the largest concentration of fashion designers and companies, it was important for us to be closer to our market. Whereas Hong Kong is a gateway to the manufacturing side of the world where we are closely working with fashion factories and suppliers to develop Techpacker as the most efficient PLM solution for the entire supply chain. c) Government Grant: Under the Hong Kong government’s new initiative to bring a technology and innovation drive into the country, they backed Techpacker to be a potential game changer in the industry and boosted our venture with a very useful grant. What are the biggest challenges of having the three of you so far apart? Are there any unexpected benefits? Most likely you will get an unsure answer if you ask someone how much technology has really brought people together. We humans are made up of natural senses, so obviously that natural connection with other humans is non-replicable. We do get on conference calls on a regular basis and also use all advanced technology to make our communications seamless, but at the end of the day I do feel that I could just walk up to my team and clarify things or have a conversation that is not about work. But on the brighter note, we have developed a deep understanding of our job roles and a trust that anything each of us do ultimately corresponds to the better of Techpacker. And that confidence in each other makes us work as one force that’s developing in all directions of the world. What does sustainable mean to you? In broad terms, to me being sustainable means to be able to keep doing something for a long period of time. And to be more specific towards the fashion industry, I think a sustainable approach is very important towards how we uphold a business and also being mindful of its environmental implications. This means, right from the beginning young designers or start-ups should take calculative and balanced decisions in the best interest for the long-term survival of their business. Often many young talented designers who go on to start their own lines do not take scalable business decisions and pile up unnecessary overheads that ultimately force them to shut down. Transparency is something the global fashion industry is struggling with. How does Techpacker influence fashion industry transparency? In all true essence, fashion is an art of individual expression and it is very important for designers to take measures to protect it from infringements and duplications. But at the same time I feel our industry is a bit too over-protective about everything and has been rusted with a mistrust amongst each other that in grand scheme of things is actually hindering the collective growth of our industry. Our CEO, Saral Kochar has written a lot about how our industry is in dire need to develop some open-mindedness towards sharing basic information with each other so we can work smartly, collectively and most importantly to help out our budding fashion designers. At Techpacker we are pushing very hard to bring that change by building the industry’s first open source fashion library. By instigating collaboration amongst fashion designers, brands, product developers and even suppliers, to share and contribute basic resources like sketches, sewing and seam diagrams, point of measurement diagrams, materials such as fabrics, zippers, buttons etc. to this library. This way we believe we can work better for the industry together. Learn more about Explore from here. How Techpacker can help the designer have transparency in their supply chain? Techpacker is very thoughtfully designed for designers so they can easily organize and monitor their design developments with factories and teams visually. We wanted to create a fun, inspirational visual environment for them that also provides efficient supply chain management capabilities. Hence we came up with the Cards system. We broke down each style tech pack into several small components called cards, which carries its own set of related information. For example a zipper card will include a description and its image, a bill of Material (BOM) table, due date and approval status monitor and it even stores the conversations or files shared with supplies and team together in one place. This makes the entire workflow well organized and transparent for designers to keep an efficient control over their supply chain. In regards to the open source part of techpacker, what are the challenges to getting designers to share in this way and in your opinion, why is this shift in thinking and sharing so important to the industry today? One of the biggest challenges is convincing designers about the benefits of open source and encouraging them to contribute to our community library. Often a designer’s first reaction to open-source is that all their work will be disclosed to the public and get copied by others. But that’s not the case. We did an internal research and found that 60% of tech pack information is actually repetitive and sharable. For instance the "How to measure" guide with sketches and description, basic silhouette flats like t-shirt or a pencil skirt, images of basic materials like button or fabric constructions, sewing diagrams and techniques, digital images of Pantone color chips, etc.. Most of this information is already available online or in textbooks, but is all scattered out. So we are constantly promoting this idea of a community resource library where they all can exchange this basic information in one place and can save time spent generating this same data for their Tech packs. If you ask any programmer or developer from the IT industry, they will tell you how much they benefit from belonging to an open source community. It helped them to establish reputation, gain respect and valuable experience from each other. In return the tech companies gain faster innovations. This is the level of collective approach that is also required in the fashion industry. We need to keep reinventing ourselves so our new generation of design talent can be empowered with possibilities of acquiring and making things easily and bringing about a real change in the world. For instance a company called Coeio recently joined us on Techpacker who are building burial suits made out of mushrooms that basically turns our bodies into compost after we dye, consuming dead cells and filtering out pollutants in the process. Like them there are so many great designers and their concepts out there that can make a big difference in the world and we as an industry should be supportive to give them the basic resources they need. How did you discover Manufacture New York. Tell us about working in their innovative environment. I learned about Manufacture New York through a friend who attended one of their events in the garment district. I researched more and found an interview by Bob in which she talked about her plans and vision for MNY and was completely amazed by it. I was simply sold on her ideas of building an eco-system that brings together the entire supply chain, including fashion technology start-ups all under one roof. It was a perfect opportunity for us to incubate in this kind of environment where we sit right in between designers and manufacturers and keep developing our technology. And that’s how it has turned out for us to be in this exclusive environment where everyone is constantly learning from each other. I think the foundation of this kind of institution actually embarks a great level of forwardness in how our fashion industry can collectively work and grow together. You have some exciting upcoming collaborations. What can you tell us about them? Yes we have been very fortunate to associate ourselves with many other game changers in the industry. For instance working with Manufacture New York itself, we are strategizing on how to implement Techpacker into their product development room to streamline the entire communication process between them and their clients. Besides, we also teamed up with Brooklyn Fashion Design Accelerator and High School of Art & Design New York last month to develop their first full fashion collection for a fashion show. These young designers used Techpacker technology to put together their designs and managed Product development with BFDA for the show. Besides to develop our open source fashion community we are encouraging larger recognized brands and suppliers from all over the world to contribute resources to our library. So far we have Alvanon (a recognized grading company), Mainetti (packaging suppliers) who we have already partnered with and we are finalizing on some very big names who you will be hearing about very soon. What are you proud of? I think I have been very fortunate to be around very inspiring, caring and understanding people in my life. And not for a moment do I take that for granted. My family and friends is my long-term wealth and I am proud of a good relationship that I have formed with them. What advice do you have for fashion industry entrepreneurs? Just be humble to others. Everyone is fighting a battle, so try to see other's perspective and do not judge others just by their appearance. Especially the people of the fashion industry and their looks can be quite deceiving. So be respectful to other and treat everyone equally because you never know what great opportunities you could gain and miss out on. As an entrepreneur what was the best advice that you have ever received? It’s not about how hard you work, it’s about how smart you work. A good and efficient use of time for work-life balance is the right way to go about long-term success in everything.